Black polyester (carbon reinforced) case with a black rubber strap. Unidirectional ratcheting black polymer bezel. Black dial with luminous hands and black Arabic numeral hour markers. Minute markers around the outer rim. GMT scale. Date display at the 3 o'clock position. Swiss quartz movement. Scratch resistant mineral crystal. Protected crown. Screw down black carbon reinforced case back. Case diameter: 44 mm. Case thickness: 10 mm. Tang clasp. Water resistant at 200 meters / 660 feet. 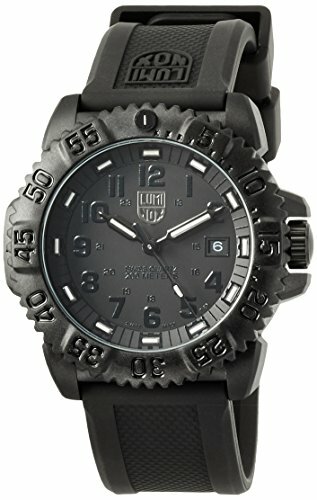 Luminox Evo Navy Seal Blackout Mens Quartz 3051.BLACKOUT.